It was a week of outdoor action with races on all though the week as the hot weather continued not the weekend. In the second Catforth Canter 5km this year on Saturday evening Paul Gregory finished 7th in 18:22 placing 3rd M40. Paul Hetherington was 8th and 4th M40 in 18:31, with Andrew Harling 11th in 19:37. Richard Davies came in 18th in 21:31 and was the 1st M55. 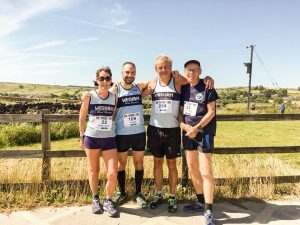 Martin Allinson was 23rd with 22:33; Phil Leaver 28th and 2nd M60 in 23:57; Kay Twist placed 5th woman and was 1st W45 in 24:49 (30th overall); Maureen Danson was 7th woman and 1st W50 in 24:49; James Danson finished 35th in 25:54; Kerry Eccles was 9th woman and 1st W55 in 26:24. Wesham are 2nd in the Open Team category in the Inter Club Grand Prix after the fourth fixture at Norbreck last week. The women are languishing 4th overall despite a great performance at two of the four races so far. The Women Masters (W40+) are 3rd. The Men’s Masters are currently top of the league with the M50s 4th and the M60s 3rd. The next fixture is at Wesham on Monday 23rd July. Daniel Shaw completed the Scafell Trail Marathon in 5:19:57 and placing 7th with an excellent performance. Starting in Keswick and following the lake shore and the valleys the race was 27 miles with 1800m of climb. Simon Eaton ran the Ultimate Trails 55k (34.2 miles) from Ambleside, completing the course in 8:32:45 in 108th place. Charles Colby finished 91st in 8:17:48 and Angela Colby 182nd in 9:32:26. Paul Gregory was the only Wesham runner in Tuesday evening’s 20 Barriers Race in Carnforth, a 6-mile cross-country race following canal towpaths, green tracks and over fields and through woods with the 20 stiles to climb. He finished 11th in 39:39. There were only 74 runners this year without any incorporated championships or grand prix being staged. Sarah Sherratt ran the Tockholes Evening Fell Race over 9.2 km distance and finished 81st in 52:19, 7th woman and 1st W45, a great result. Kath Hoyer was 107th in 58:26, 14th woman and 1st W55. The second Badger 10k Race took place in Cuerden Valley Park on Thursday evening on another beautiful summers evening. Paul Gregory finished 11th in 40:52 1 second faster than last month’s race coming in 2nd M40. Anne Berry was 34th woman and 4th W55 in 60:09 in 111th place overall. Phil Leaver finished 1st M60 in 51:28, 68th overall. The Forton 5k also took place on Thursday evening and Dave Young finished 24th in 25:16, 1st M70. The family Gore ran together, with Megan finishing 45th in 28:54 with a 3-minute improvement on her 5k time with Steven and Vicky recording the same time. Steve Abbott ran the Lostock Hall Carnival 5k on Saturday and he finished 41st in 21:19 in a good race. Paul Carter ran in the Bentham Beagles 10k race on Sunday, finishing 79th in 62:57. Kim McGuire ran the Blackpool Summer 10k on the North Promenade, finishing 74th woman and 184th overall in 64:13. David Taylor was the leading Wesham runner in Saturday’s Lytham Hall parkrun, with the 3rd fastest time of the day 18:05 for an age graded performance of 71.91%. Carl Groome ran 19:32 for an M45 grade of 74.91%. John Burns scored an M60 76.00% performance with a time of 21:40 and Jason Blagden clocked 22:07 for M45 64.58%. Elliot Costello had 22:38 for 57.00%. Sharon Cooper ran her debut in her new age category W45 with 22:57 for 69.21%. Stephen Twist ran 25:16 for an M50 grade of 58.84%; and Sue Rigby 29:58 for W40 52.50%. In the Preston parkrun Robert Brown ran 25:46 for an M60 grade of 62.81%. Elizabeth Johnson ran 28:25 with W35 53.26%; and Lynn Brown 36:06 with a W55 50.83%. Chris Pike was at the St Helens run and he recorded 26:53 for M40 51.95%. George Kennedy was in Tring again and ran 25:31 for an M60 62.83%. In Blackpool’s Stanley Park Dave Marsland was the Wesham leader with 22:29 for M60 72.57%; Stephen Browne ran 22:47 with M50 65.76%; Rob Wallace 24:03 with 53.64%. Dave Young was the leading M70 with 66.79% from his time of 26:24; Andrew Moore ran 27:16 with an M55 56.85%; Graham Brook 30:31 with M50 49:10%; and Emma Wright had 31:22 and W40 48.78%. The travelling Gores were in Leeds a week late for the Endure24 but they were in Armley Park on a 3-lap double loop course with Vicky running 26:35 for W40 58:31 and Steven in pace duty with the same time.